Blackheads on Nose Won’t Go Away? They Might Be Sebaceous Filaments! Do you constantly squeeze out blackheads from your nose, only to find that they return a few days later? 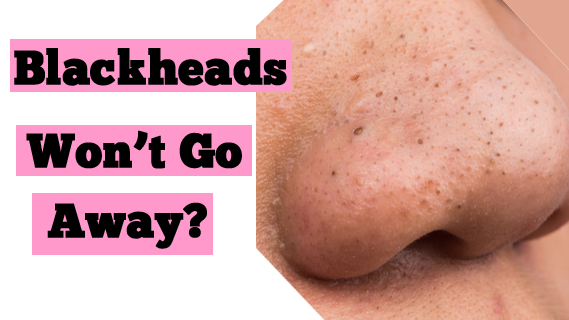 Well you might be shocked but what you’re squeezing out of the pores on your nose aren’t actually blackheads! Read today’s blog post to find out what they are and if there’s anything you can do to prevent them from coming back! When I decided I wanted to blog about acne, I knew that one of the most important topics I needed to cover was sebaceous filaments. Sebaceous filaments are constantly mistaken for blackheads because they appear to be so similar. They are not related to acne! Everyone on earth has sebaceous filaments, even those that are not acne-prone. These lucky, pimple-less people usually have smaller pores than those of us who are acne-prone so their filaments are not as visible. BUT, if you were to squeeze the pores on their nose or any other areas where filaments are more concentrated, you would see that they also have them just like us acne prone people do. So let’s talk about the differences between blackheads and sebaceous filaments. A blackhead, also known as an open comedo, is a non-inflamed acne lesion that is mainly made up of dead skin cells and oil. Its dark appearance is a result of oxidation, similar to what takes place after an apple is sliced. A blackhead most times is slightly raised and feels a little bumpy if you brush your hand over it. On the flip side, a sebaceous filament forms from an impaction of oil in the pore. Everyone on earth produces oil to some extent so that is why everyone on earth has sebaceous filaments. A blackhead goes a step further by combining an overabundance of dead skin cells with the oil. That’s because acne prone people create up to 5 layers of dead skin cells a day, whereas those that aren’t acne prone create a regular 1 layer of dead skin cells that easily sheds and doesn’t get clogged inside of the pore. Sebaceous filaments are usually yellow or a lighter gray in color than a blackhead. And finally, sebaceous filaments are typically flush with the skin so if you brush your hand over your face, you generally would not feel them, unlike a blackhead. Now sometimes these filaments can poke out of the pore opening a bit, but usually they are level with the skin. Exfoliating products and treatments may minimize their appearance BUT you can’t get rid of them completely! No matter how many nose strips you use (which by the way I don’t recommend) or how thorough your esthetician is with extractions, these filaments always fill right back up. That’s because you are always producing oil so there is no way to prevent them from coming back. They are just a normal part of your skin. What’s worse is that repeated pressure from picking at the same area of the skin can cause broken or dilated capillaries. Trust me on this one, I know from personal experience. That is why at our Luminosity Acne Skincare office, we do not extract sebaceous filaments for our clients. We don’t want to risk breaking their capillaries and these filaments just fill right back up so there is no point to extract them. We do extract true blackheads though because once they are pushed out the skin, our products will prevent them from coming back. So while exfoliating products and treatments can help to minimize the appearance of sebaceous filaments, the best thing to do is to make peace with them and know that everyone else has them too! Just recognize that they are meant to be on your skin! It’s also important to realize that most people do not even notice them on your skin! I’ve made peace with mine many years ago and they no longer bother me. I encourage you to put away the magnifying mirror and make peace with yours as well. One major acne treatment mistake is treating all types of acne with the same methods. But different types of acne require a different approach if you’re going to be successful in clearing up the skin. Make sure read today’s post so that you’ll know the correct way to properly treat your breakouts. In order for the information in this video to make sense, it’s important to make sure that you didn’t miss my last post which covers the difference between inflamed and non-inflamed acne and shows you how to know which type you have. It’s important to first identify your acne type before you starting treating your skin, so make sure to read my previous post first. With inflamed acne you should know that these pimples will heal on their own if you give them enough time, however new ones always seem to pop up just as the previous ones start to heal up. With the right products you not only speed up the healing time for these pimples, but more importantly prevent new ones from forming. A product routine for inflamed acne should focus on exfoliation, anti-inflammatory action, and anti-bacterial action. Each of these are equally important to combating inflamed acne. Exfoliation will unclog the current buildup of dead skin cells and oil, as well as prevent future clogging from taking place. Exfoliation is crucial to clear skin because those of us that are acne prone create up to 5 layers of dead skin cells per day, while those that aren’t acne prone typically create 1 layer of dead skin cells. When the pores are clogged, this creates an anaerobic environment, or environment absent of oxygen, which is exactly what the inflamed acne causing bacteria loves. So it’s important to prevent this clog from taking place by continually keeping your skin exfoliated. Anti-inflammatory action will bring down pain and swelling from inflamed acne lesions and just generally heal them up much faster. Anti-inflammatory action is also important when trying to minimize post inflammatory hyperpigmentation because the less inflamed your pimples get, the lighter these marks will become. Anti-bacterial action will help to keep the special p. acnes bacteria that is responsible for inflammation in check. It will ensure that it doesn’t get out of hand from the beginning. 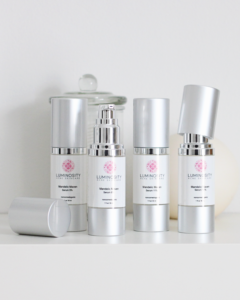 At Luminosity Acne Skincare we have products that tackle every need for inflamed acne to help heal it up quicker, but more importantly prevent it from re-occurring. Some of our favorite go-to ingredients are Mandelic Acid, Lactic Acid, Benzoyl Peroxide and extracts such as Green Tea and Chamomile. If you’re new to our products, I recommend you start with our Breakup with Cystic Breakouts Kit. Besides clearing up acne, our products also eliminate hyperpigmentation which is the leftover dark marks after a pimple has healed. Once you’ve selected acne products with ingredients that have the right properties to fight inflamed acne, you’ll need to make sure that you stay away from anything that creates friction on the skin, including rubbing or scrubbing. This means no scrub cleansers! Always select a gentle cleanser without any beads or scrubbing particles. Furthermore you should absolutely avoid rotary skin brushes, washcloths, cleansing clothes or makeup remove wipes. Friction or scrubbing of the skin can create more inflammation which means your breakouts will become larger, more swollen and more painful. Also for those with a darker skin tone, you may hyperpigment your skin in splotches. Fighting the urge to scrub away pimples and cysts may be hard, but it’s in your skin’s best interest. Trust me! You’ll only be doing more harm than good. If you wish to take things a step further and combine your at-home acne product use with professional treatments then I recommend seeing an esthetician for a series of chemical peels. Chemical peels are best suited for the needs of inflamed acne. At our office we use peels that have ingredients that tackle both the acne and hyperpigmentation at the exact same time so that both conditions can be resolved. Because microdermabrasion is abrasive so it creates too much friction on the skin therefor which will lead to more inflammation so I would stay away from this treatment for inflamed acne. Unlike inflamed lesions, non-inflamed lesions such as blackheads and closed comedones typically do not heal up on their own if you wait it out. The skin just continues to accumulate more and more of these lesions. The best product routines for non-inflamed acne need to be hyper-focused on exfoliation. That’s because non-inflamed acne is mainly a buildup inside of the pores of dead skin cells and oil. There is some bacteria present but it’s not a main component like with inflamed acne so the focus should be on exfoliation. Exfoliation will unclog the current buildup of dead skin cells and oil, as well as prevent future clogging from taking place. I recommend exfoliation through the use of scrub cleansers, Mandelic Acid, Lactic Acid, and Benzoyl Peroxide. You may be surprised I mentioned benzoyl peroxide when talking about exfoliation, but a little known fact about it is that it has the ability to peel or exfoliate the dead skin cells that cling to the inner lining of the pore wall. I cover this ability in more detail in my previous blog post titled, Benzoyl Peroxide Mistakes. Although I do recommend scrub cleansers for non-inflamed acne, I still want to caution you to stay away from the other things that will create friction on the skin such as rotary skin brushes, washcloths, cleansing wipes and makeup remover wipes. That’s because if you combine these with the scrub cleanser then you may be over scrubbing or rubbing the skin which can lead to sensitivity, hyperpigmentation, and may even create some inflammation which can turn that small manageable blackhead into a painful, large and red inflamed pustule. I recommend that if you have non-inflamed acne that you schedule a series of chemical peels or microdermabrasion sessions with an esthetician that is experienced in treating non-inflamed acne. That’s because in most cases, homecare products alone cannot clear up or prevent non-inflamed acne. They are far too stubborn and impacted in the pores. Non-inflamed lesions need to be properly extracted out or else they continue to just sit in the pores and accumulate more and more as time goes by. This results in a bumpy texture to the skin. Proper extraction of non-inflamed acne includes prepping the skin with a series of chemical peels or microdermabrasion. These treatments help to loosen the clog inside of the pore so that they can be extracted easier and with less force. Now what if you have combination acne which is both inflamed and non-inflamed? The best thing to do is to treat the inflamed acne first since it is more painful and needs less friction inducing methods. Once the inflamed lesions are under control, then switch gears to the non-inflamed acne. You can add in a scrub cleanser and get your pores professionally peeled and extracted. 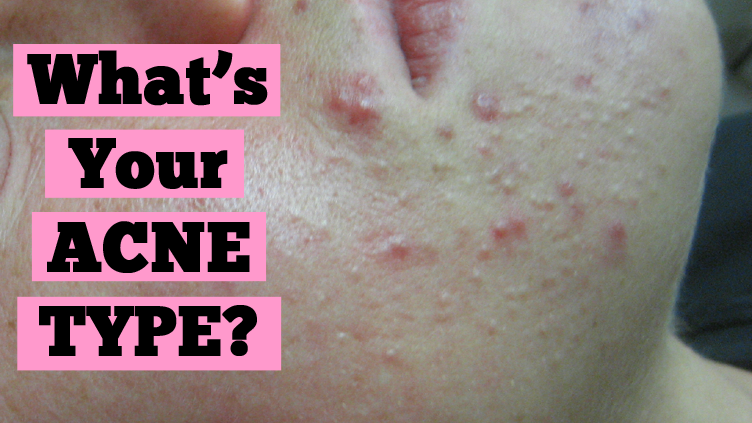 Have you figured out your acne type? If so, in what ways will you be changing your skincare routine to make it more effective? Have an idea for a blog post topic? Leave a comment below! Inflamed Acne vs. Non-inflamed Acne: What is My Acne Type? Did you know that there are more than 1 types of acne? And that your acne type determines which products you should be using to successfully clear up your skin? As an acne specialist, the most important determining factor when it comes to selecting the right products for my clients is their acne type. This is the basis of my product recommendations. From there I look at severity, oil production, and skin sensitivity, but the foundation is always acne type. There are 2 main acne types, Inflamed and Non-Inflamed. Side note: there is a third type known as Combination Acne which is exactly what it sounds like, a combination of both inflamed and non-inflamed acne, however most people will be dominantly either inflamed or non-inflamed. Before I explain the 2 acne types, I first want to talk about micro-comedones. All lesions whether inflamed or non-inflamed start out as a micro-comedone. A micro-comedone is the initial build up of dead skin cells and oil. This comedone is very tiny and starts underneath the skin. It is not visible until it grows into an inflamed or non-inflamed lesion. Fun fact alert…comedo is Latin for “fat maggot.” You see, back in the day, scientists thought some of these acne lesions were maggots eating oil! Yeah, I know that’s not a pleasant picture. As these micro-comedones grow in size by collecting more dead skin cells and oil, they will either become inflamed or non-inflamed. The path they take is mostly pre-determined based on your genetics. What I mean by that is that some acne prone people are genetically pre-disposed to have a higher potential for bacterial build up and inflammation while others don’t. First let’s talk about inflamed acne because this is the most common acne type. An inflamed pimple starts out as a micro-comedone, which again is just the beginning mass of dead skin cells and oil inside the pore, at this point there is no inflammation. But then it takes a turn for the worse as bacteria gets added into the mix. This bacteria is found in the skin and it feeds itself on oil. Once the oil is consumed, a waste by-product is created which is highly inflammatory to the skin so the end result is a red, painful and often times pus-filled pimple. If you haven’t read my previous post on the real cause of acne, I highly recommend that you take a look at it so that you can have a better understanding on how acne forms inside of the pore. Inflamed lesions also tend to hyperpigment the skin once they are healed. Hyerpigmentation from acne are those leftover dark marks that can be pink, red, purple, or brown. Inflamed acne consists of papules, pustules, cysts and nodules. Papules are small, pus-less red bumps and often times are sore or tender. Pustules typically start out as a papule and later become inflamed and pus-filled. This happens because the pore wall ruptures closer to the surface of the skin and leukocytes or white blood cells are rushed in to fight off bacteria that is present within the pore. The visible pus you see contains these white blood cells. Cysts are large pus-filled lesions that appear boil-like. They can be extremely painful. Nodules are hard, deep lumps that often times do not contain pus. They are very painful and extremely slow to heal. Non-inflamed acne starts out the exact same way that inflamed acne does, and that is as a micro-comedone. To review, a mico-comedone is the beginning mass of dead skin cells and oil. Unlike inflamed acne, bacteria isn’t as much an issue to the pores of someone that is prone to non-inflamed acne so this micro-comedone continues on by accumulating mainly just dead skin cells and oil. Because bacteria isn’t accumulating along with those dead skin cells and oil, that means that the potential for inflammation to occur is very low. Now on a side note, if you were to improperly pick at non-inflamed lesions then you will most likely cause some unwanted pus and inflammation to occur which basically just means that you’ve now created inflamed acne. While non-inflamed pimples don’t hyperpigment the skin on their own, if you picked at one more than likely you’ll be left with some hyperpigmentation from the inflammation that you caused. Non-Inflamed acne is made of blackheads and closed comedones. These lesions are not red, inflamed nor painful. They just sit on the skin until they are properly extracted. Blackheads are the most common type of non-inflamed acne and they are a mix of dead skin cells and oil. It is a huge misconception that the top of a blackhead is dark due to accumulation of dirt. What you are seeing is simply oxidized oil (and some melanin). Think along the lines of what happens to an apple that is sliced and exposed to the air…it starts to oxidize and darken so the same thing is happening with a blackhead. Closed Comedones are also a mix of dead skin cells and oil, similar to a blackhead, however the pore opening is completely blocked. This prevents oxygen from creating oxidization like with a blackhead, so closed comedones stay flesh colored. If there was anything positive to say about closed comedones, it would be that the fact that because they are flesh colored that makes them harder to be noticed, especially when comparing them to red, pus-filled inflamed lesions. Those were the 2 main acne types, inflamed and non-inflamed. Now as I mentioned earlier there is a 3rd type which is known as combination acne and it’s exactly what it sounds like which is acne that presents both inflamed and non-inflamed lesions. In my next post I will go over the proper way to treat and select the right products for each type of acne because each type requires a different approach. What is your acne type? If you are combination, then are you more dominantly inflamed or non-inflamed? 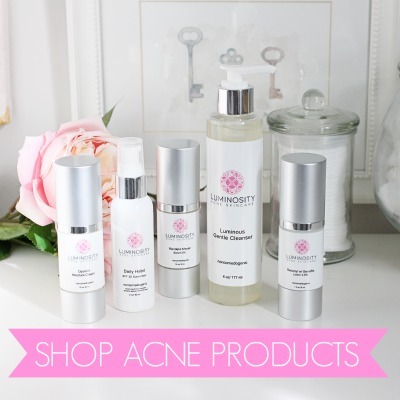 Have you used every drugstore or over the counter acne product and gotten little to no skin clearing results? If so, just know that you aren’t alone! 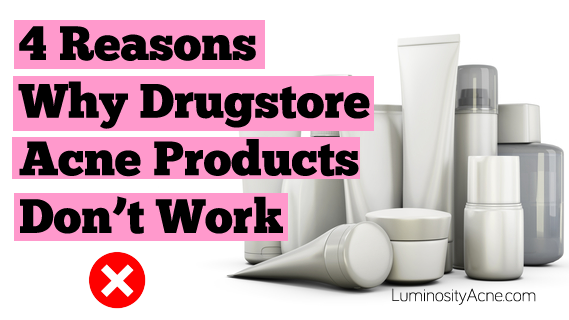 In today’s blog post I’ll go over the most common reasons why drugstore acne products don’t work. Before I dive into the 4 reasons why drugstore acne products don’t work, I want to first say that I understand that my opinion on this topic may come across as biased being that I am a licensed esthetician with my own brand of acne products, but the reasons I am about to present are legit! Ok so now that that’s out of the way let’s get started with the reasons why these inexpensive drugstore acne products don’t work to clear up your acne. Believe it or not, most of these products contain pore clogging ingredients despite the claims that they are making. A product may say that it’s non-comedogenic, oil-free or formulated for acne but none of those claims guarantee that the product is truly acne-safe because the FDA does not regulate these claims. I put together a previous blog post that talks more in depth on pore clogging ingredients and how to check your current skincare products and makeup to make sure they don’t contain any pore cloggers. Make sure not to miss it! 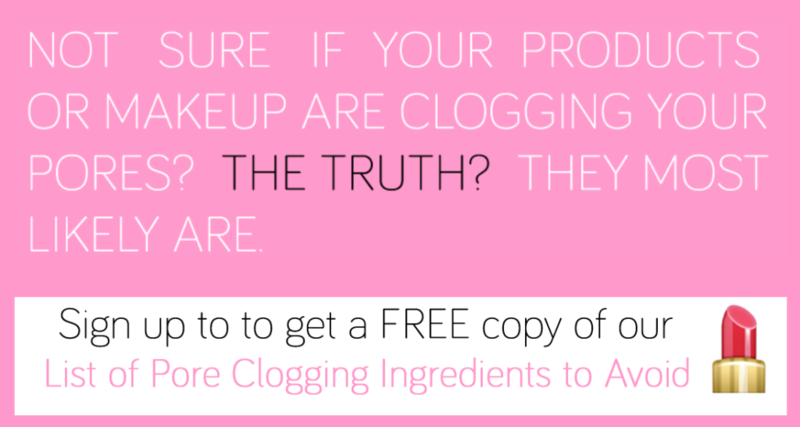 Knowing if your products are breaking you out is so important! Many of these drugstore products rely on outdated salicylic acid or glycolic acid, but the best alpha-hydroxy acid for acne is Mandelic Acid. Mandelic Acid is multi-functional and is indispensable when it comes to clearing up the skin. I know that most of you have tried benzoyl peroxide and it didn’t quite do the trick on clearing up your skin, but believe it or not, benzoyl peroxide is a very important and indispensable component in your skincare routine, along with Mandelic Acid. There are several ways in which you are using benzoyl peroxide incorrectly. I recently wrote a blog post on it so make sure to read to find out all the ways that you are using it wrong. You can’t increase the strength of your drugstore products. Acne has an ability to adapt to the products you use on your skin. At our office, to stay ahead of this ability we periodically increase the strength or frequency of our clients’ acne products until they clear up. Once they are clear and there is no more acne under the skin then they can maintain the clear skin at this level of their product routine. Now I do understand that you can increase the level of drugstore benzoyl peroxide so you can go from a 2.5% to a 5% and then to a 10%, but you can’t do that with salicylic acid, which is the most commonly found drugstore acid. Salicylic acid can only be purchased at a 2% strength when it’s over the counter so your skincare routine is stuck there and for your products to be effective against the acne you need both your benzoyl peroxide and hydroxyl-acid product to be increased periodically or else the acne will adapt and you’ll be back at square one. Also as mentioned earlier, salicylic acid isn’t ideal for acne anyways. What has been your experience with drugstore acne products? Did you know that if you’re acne prone iodized salt can make your breakouts worse? In today’s blog post I’ll cover the connection that iodine has with acne so make sure to keep reading! At Luminosity Acne Skincare, it’s very important for us to educate our clients on certain foods that can negatively impact acne so that we can ensure our clients clear up as quick as possible. Before I move forward I just want to mention that you should not make any changes to your diet without consulting your doctor first. This post is strictly for informational purposes only and not a substitute for medical advice. One of these acne-aggravating foods is actually a mineral known as iodine or iodide and in addition to food, it may also be found in certain medications. So iodine is a mineral that we do need because our bodies need it to function properly. However if you’re acne-prone and you take in an over-abundance of iodine then some of the excess amount that your body has no use for can be excreted through the pores. As it excretes it can irritate the already sensitized follicle and create more inflammation which leads to worse breakouts. According to Dr. James Fulton iodine can create acne-like eruptions for even those that are not acne-prone if they ingest very large amounts of iodine. So if this has the potential to effect those without acne then it will certainly effect those of us who naturally breakout. How Much Iodine Do We Need? The RDA or Recommended Daily Allowance for iodine is 150 mcg per day. That’s micrograms, not milligrams, so it isn’t very much at all. In fact most of us get plenty of iodine without even knowing it and it can be very easy to go overboard which again isn’t a good idea if you are acne prone. I do want to mention though that there are some medical conditions or disorders that require you to take in an excess amount of iodine to maintain your health so as I mentioned earlier do not make any dietary changes without consulting your doctor first. 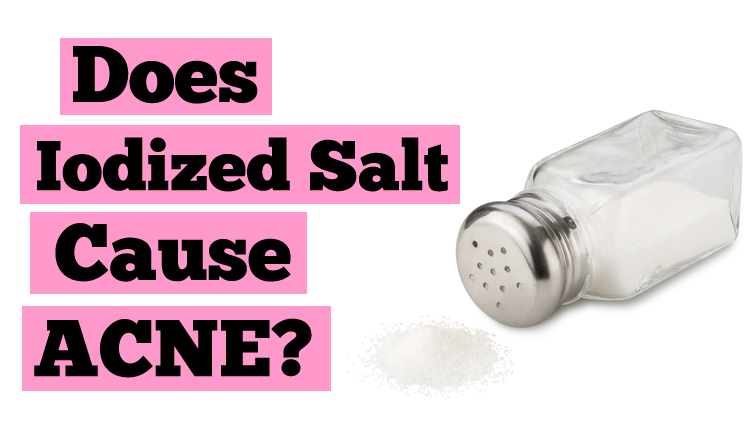 Is Salt The Same Thing As Iodine? Now when it comes to iodine most people immediately think of salt. But not all salt is iodized meaning not all salt is bad for acne. Try to stay away from using iodized salt or table salt. These salts undergo a process where all the minerals are stripped away and then excess iodine is added back in which is also known as being fortified. This practice began because decades ago people in certain regions that didn’t have access to iodine rich seafood began having iodine deficiency issues so we started fortifying salt with iodine. Although this is no longer an issue in today’s times, the processing of salt still continues. A good substitute for iodized salt or table salt would be an unrefined salt. Unrefined salts can still contain iodine but they will be the lower amount that is naturally found in the salt instead of the heavy amount added in most table salts. Many clients ask if sea salt is ok to use. I tell them to check the label and see if it says it’s been iodized because I have seen iodized sea salt on the store shelf. When eating out it’s important to know that most restaurants or fast food chains use iodized salt because it’s much cheaper than unrefined salt. This doesn’t mean that you shouldn’t ever eat out, but I recommend sticking more to grilled options than fried because fried foods tend to be salted much heavier than grilled foods. So if you want a chicken sandwich, choose the grilled one rather than the fried one. Seafood also contains iodine but its amount varies by the type of seafood you consume. At Luminosity Acne Skincare we caution our clients to mainly be aware of seaweed or kelp as those contain the highest amount of iodine and will be the most problematic for acne-prone individuals. The main sources of these that we consume would be in seaweed paper snacks and sushi. Now don’t panic about the sushi! I personally love sushi and still eat it but I don’t have it weekly because the seaweed can flare me up if I overindulge. I’ve mentioned this in my other acne foods videos and blog posts, but at our office we don’t tell our clients they can’t have any acne-aggravating foods, we just ask them to consume them in moderation because unfortunately over-doing it will result in more acne. So enjoy your sushi but don’t make it a weekly thing. A hidden source of iodine that may be surprising to most is dark sodas. Most dark sodas get their rich, dark brown color from a red dye that contains iodine. And remember that iodine isn’t salt itself…it’s simply a mineral that is most commonly found in salt but can also be found in many other foods, including this red dye. If you consume dark sodas on a regular basis then try switching to sodas that aren’t dark. Now of course I am not advocating soda drinking but I understand not everyone will want to give up their sodas so instead just switch to a more acne-friendly one. And finally a last source of excess iodine could be in your supplements or vitamins, more specifically your multi-vitamin. It’s easy to check for iodine. Just flip the label over and look for iodine or potassium iodine. If the supplement contains it then opt for a multi-vitamin without it. Some multi-vitamins or superfood supplements can also contain kelp. Make sure to avoid those as well. To play it safe I would look through the ingredients list on every single supplement or vitamin you take to be safe. Have you discovered that you are over-consuming iodine? Watch Carmen’s Video Version Of This Post: Does Salt Cause Acne? A lot of people will pick up the highest strength benzoyl peroxide they can find, which is usually is 10%. This leads to several mistakes. First is that they will dry out their skin really quickly to the point where the dryness becomes unbearable so then one would think that the logical next step would be to slather on a thick moisturizer to combat the dryness. Unfortunately heavy moisturizers interfere with the benzoyl peroxide’s anti-bacterial properties so it becomes less effective against the acne. The second issue with jumping straight away into a high strength benzoyl peroxide is that you have no room to strengthen it up. 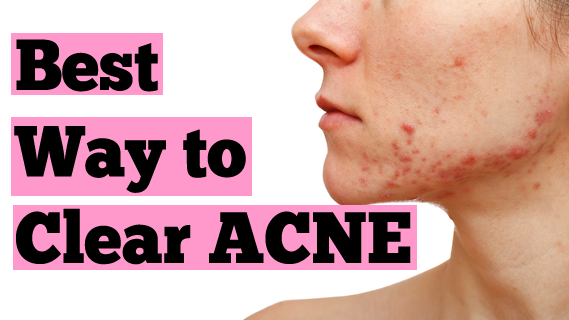 You see acne has this crazy ability to adapt to the products you use on your skin. That’s why if you’ve ever tried a new acne product you may have noticed that it works a little bit at first, but then before you know it the improvement stops and you’re back at square one with the same amount of acne. This occurs because you never strengthened up your routine to stay ahead of the acne’s ability to adapt. At Luminosity we remedy both of these issues by starting our clients out on a low strength benzoyl peroxide and strategically increasing it every couple of weeks. This allows the skin to slowly adjust with it and while some dryness will still occur, most will be able to avoid the extreme uncomfortable dryness that occurs with the higher strength benzoyl peroxide, thus eliminating the need for a heavy moisturizer which as I mentioned can interfere with the benzoyl peroxide doing its job properly. For those clients that still need a bit of moisture we recommend out Hydra Boost Gel which is a light weight hyaluronic acid gel serum that can be used in conjunction with the benzoyl peroxide without stopping it from working. Starting out with a low strength benzoyl peroxide will also allow us to steadily increase the strength of it over time so that we don’t allow the acne to adapt. I also want to mention that we aren’t increasing the benzoyl peroxide forever. We only need to increase it until you clear up. Once you are clear we can keep your routine the same to maintain the clear skin result. Another issue that occurs when making the mistake of starting off with a high strength benzoyl peroxide is that many will stop using it or cut back on how much they are applying to their skin at the first sign of dryness. While we don’t want your skin uncomfortably dry, it’s important to understand that dry and flaking skin is normal to occur. Benzoyl peroxide has this great ability which allows it to peel or exfoliate the inner lining of the pore wall. You see on a daily basis your pores are shedding up to 5 layers of dead skin cells, and on a side note non-acne-prone pores shed only 1 layer of dead skin cells per day so the difference is huge. These daily 5 layers of cells first cling to the sides of the pore wall and then they start to continue piling up and clogging the pore. Benzoyl peroxide comes to the rescue by exfoliating that liner of cells clinging to the pore wall so some of the flaking you are seeing is just exfoliation at work which is a great thing if you want clear skin! But if you back off of your benzoyl peroxide at the first sign of dryness or flaking then you are allowing these 5 layers of dead skin cells to get a hold inside of the pore again and create a clog which will only continue to result in breakouts. So remember not to skip your benzoyl peroxide and not to use less of it and that dry skin isn’t the end of the world, in fact it’s a good sign as long as it’s not extreme. Another mistake I see people making with benzoyl peroxide is by exclusively spot treating their individual pimples rather than applying it all over. I’ve written a previous blog post on this subject and you can click here to read it. Another mistake is by not rubbing it into the skin thoroughly enough. Make sure that you really work it into your skin so that it can deliver its anti-bacterial properties properly. Finally the last mistake we see people making with benzoyl peroxide is that they don’t pair it with a good exfoliating serum. While benzoyl peroxide does have the ability to peel inside the pore, your skin will clear up much quicker and better if you pair it with a serum that is designed to exfoliate. That’s because as I mentioned earlier acne-prone skin sheds up to 5 layers of dead skin cells per day so it’s important to really focus on exfoliation so that we don’t allow those cells to create clogs. Now many people opt for salicylic acid or glycolic acid, but the superstar at our office is our Mandelic Maven Serum which contains Mandelic Acid. Mandelic Acid is superior to any other acid on the market because it tackles every aspect of acne clearing. It’s anti-bacterial to kill the acne causing bacteria, it’s exfoliating to prevent dead skin cells from clogging the pores, it has anti-inflammatory properties to bring down cysts, and it has hyperpigmentation lightening properties to speed up the fading of any leftover dark marks from past breakouts. It really does it all for acne, but it’s important to always pair it with benzoyl peroxide in order for each of these products to work to the best of their abilities to fight acne. So those are all the mistakes that I see people making when it comes to using benzoyl peroxide. Benzoyl peroxide can be amazing at fighting off acne but you need to use it properly or else it won’t be effective. 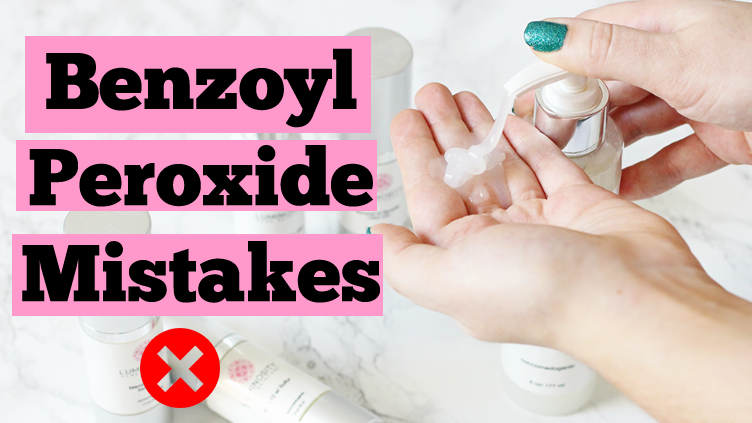 Have you been making any of these common benzoyl peroxide mistakes? You may have heard that dairy products or milk cause acne, well they don’t cause it but they can make it worse! Keep reading today’s blog post to find out why dairy may be adding to your skin issues. It’s important first know dairy doesn’t cause acne, but if you are acne-prone then it can make it worse! The first reason is due to hormones. Dairy cows are pregnant for the majority of their lives therefor they are constantly producing high levels of hormones which in turn find their way into the dairy we consume. These hormones can stimulate our oil glands to produce more oil which will mix with an overabundance of dead skin cells which results in a clog inside the pore. With enough time this clog will turn into a pimple. Now it may sound like the best solution would be to only consume organic dairy products or ones labeled as “Hormone-Free”, but organic and hormone-free only ensures that you are not getting artificial hormones from the milk or cheese. However you are still getting the cows natural hormones as they are present in the milk and then all of the products the milk gets turned into like cheese or ice cream. So always remember that there is no such thing as hormone-free dairy. The second reason why dairy products affect acne is that they tend to contain high levels of iodine. Iodine is a trace mineral that our bodies do need for good health, however if you over-consume it then some of the excess amount that our bodies have no use for can be excreted through the pores. As it’s being pushed out it can be very irritating to acne prone skin and can create worse breakouts. The reason why dairy contains high levels of iodine is that dairy farmers give their cows an iodized salt lick or they fortify their feed with iodine as this helps them ward off infections. So to recap, dairy doesn’t cause acne but if you are already acne-prone then dairy can make your acne severity worse through hormones and excess iodine. At Luminosity Acne Skincare we recommend that our clients consume dairy in moderation. It’s ok to have it here and there but be aware that if you go overboard on the dairy then you’ll end up with worse breakouts. If you do find yourself consuming large amounts of dairy on a daily basis consider switching to a more acne-friendly alternative such as almond milk, rice milk, or coconut milk. I don’t recommend soy milk though because soy has its own problems when it comes to dairy. Another thing important thing to mention when talking about dairy and acne is protein powders. The most common protein powders available are whey or casein based which are derived from dairy. A better alternative would be a plant based protein powder like brown rice. In fact there are so many plant-based protein powders coming out so you shouldn’t have any trouble sourcing one, however make sure to avoid soy-based protein powders. 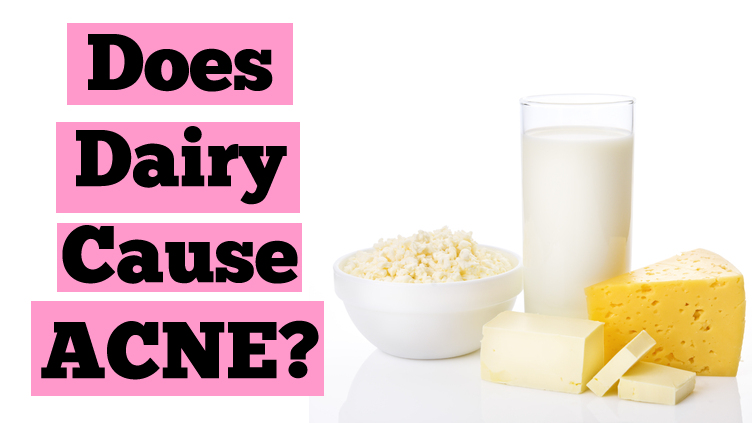 Have you noticed a link between dairy and your acne’s severity? Watch Carmen’s Video Version Of This Post: Does Dairy Cause Acne? Do Peanuts or Peanut Butter Cause Acne? 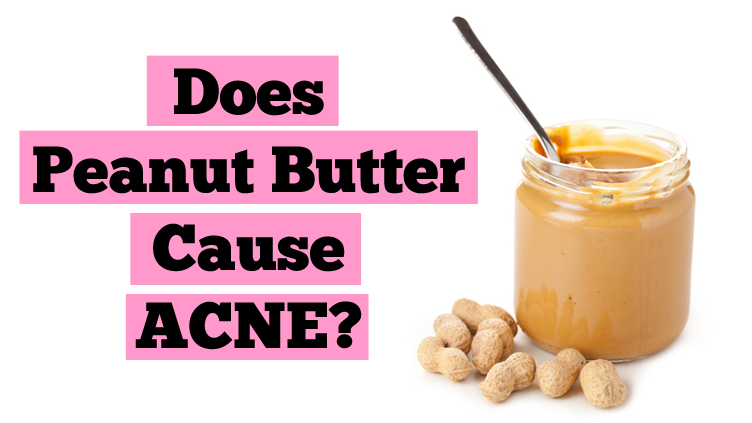 Are you wondering if eating peanuts or peanut butter is the cause of your acne? Right off I’m going to let you know that peanuts are not the CAUSE of your acne, however they do play a role with its severity. If you are curious about the real cause of acne make sure to check out my past post where I go in depth on what causes it. OK let’s get back to the peanuts. So as mentioned, even though peanuts do not cause acne, they do play a role with the severity of your acne. That means that if you are already breaking out then consuming too many peanut-based products can make you breakout worse. Worse breakouts mean different things to different people. For some it can mean that they go from getting 5 new pimples a day to 10 new pimples a day, while for others they may get the same number of breakouts but they become larger, more inflamed and more painful…and unfortunately for others their severity may worsen by both factors, so not only do they get more pimples but they are also larger and more painful. Either way, increasing the severity of your acne is never a good thing. Let’s now discuss the reasons why peanut butter can worsen your acne. Reason #1 – Peanuts have an androgenic effect on the body. Androgens are male hormones, like testosterone, that can increase oil production. Oil mixes in with dead skin cells inside of the pore and creates a clog. This clogged pore may later become inflamed and rupture into a pustule or painful cyst. The last thing someone that is acne prone needs is more oil. Reason #2 – Peanuts are high in Omega-6 Fatty Acids. Omega 6 Fatty Acids promote inflammation in the body, including the skin so your acne will be more severe. Now make sure not to confuse Omega 6 Fatty Acids with Omega 3 Fatty Acids. Omega 3’s are anti-inflammatory so they are beneficial to acne prone skin unlike Omega 6s. Reason #3 – Most commercial peanut butters contain hydrogenated oils or trans fats. These oils stimulate inflammation in the body so again you will be left with more severe acne. Reason #4 – Peanuts and peanut butter that are salted are most likely salted with iodized salt. If the body gets an overabundance of iodine then some of the excess amount that it has no use for may be excreted through the pores. For those that are acne prone, this can stimulate more inflammation. So those are the 4 reasons why peanuts or peanut-based foods like peanut butter and peanut oil are not ideal for those that are suffering from acne. Now at Luminosity we like to educate our clients to keep everything in moderation, we don’t believe in 100% depriving yourself because you’ll just set yourself up for disaster. So either keep the peanuts to a very low minimum or switch to a slightly more acne-friendly nut like almonds. Keep in mind though that almonds still contain Omega 6 Fatty acids so make sure not to go too crazy on them, but they aren’t an adrogenic food so that’s a plus for us acne prone people. Furthermore, I recommend eating unsalted almonds and natural, unsalted almond butter. Check the ingredients label to make sure it doesn’t contain any hydrogenated oils. Have you noticed any changes with your acne severity when you eat peanuts? 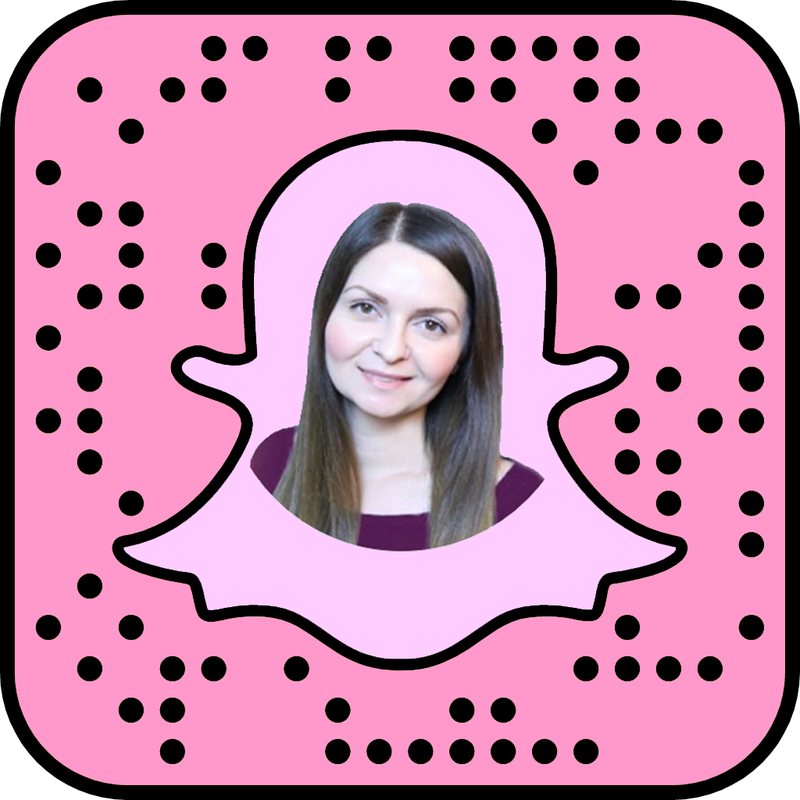 Watch Carmen’s Video Version Of This Post: Do Peanuts Cause Acne? Does Drinking Water Clear Up Acne? The answer may be surprising, but unfortunately increasing your water intake alone does not clear acne. Now, I am not saying that water doesn’t have its place as part of a good plan for healthy skin, but when we are specifically talking about clearing up acne, it just doesn’t do the trick. A lot of people are under the assumption that acne is caused by toxins trapped within the skin or body and that drinking water in heavy amounts will push the toxins out and the skin will subsequently clear up. This prevalent myth that toxins cause acne is unfortunately misleading a lot of people. The truth is that acne is a genetic condition that effects the function of the pores. It’s as simple as that. If you mainly consume dark sodas throughout the day and you decide to replace these drinks with water then you may notice your acne severity decreasing. This is because most dark sodas contain a red dye, erythrosine, which contains iodine. I’ll talk more about iodine and its effect on acne later, but for right now just know that excess iodine can make acne more severe. So to summarize, water itself does not clear up acne, however if you replace your dark sodas with water then you may notice your acne severity decreasing, but it’s not the water itself, it’s the fact that you have removed a source of excess iodine from your diet that was previously aggravating your acne condition. Have you noticed any changes with your acne by drinking more water? 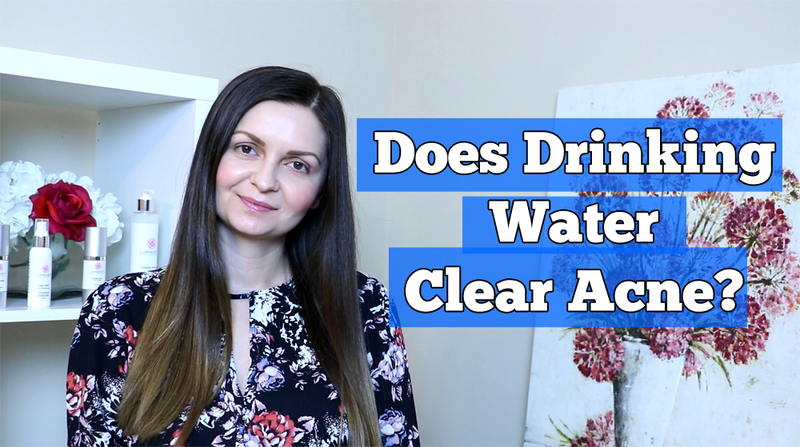 Watch Carmen’s Video Version Of This Post: Does Drinking Water Clear Acne? 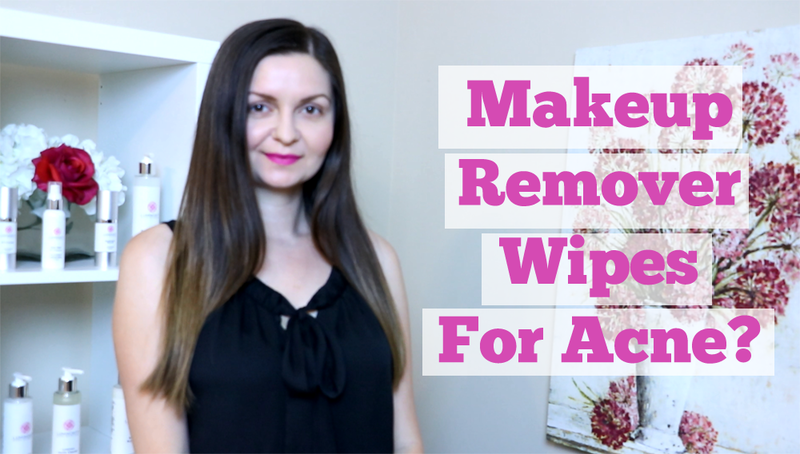 Do you rely on makeup remover wipes to clean your skin at the end of the night? If so make sure not to miss today’s post! A big mistake that I see acne-prone people making when it comes to removing their makeup or just cleansing their skin at night is relying on makeup remover wipes instead of using a cleanser. There’s a few reasons why I am against these wipes. They can create too much friction for those with cystic or inflamed acne. If you have inflamed acne then it’s really important to stay away from anything that creates friction on the skin including scrubs, rotary brushes, washcloths and makeup remover wipes. The friction can create irritation which can lead to more inflammation and that’s the last thing you need with cystic acne. At our office, we educate our clients with inflamed acne to stay away from anything abrasive because it can slow down or prevent their progress toward clear skin. These wipes can leave behind a residue and that’s problematic for 2 reasons. First is that depending on the ingredients found in the wipes, it can be pore clogging so this lingering residue can create breakouts. Second is that this residue can prevent the subsequent acne products that you use from fully penetrating into your skin. If your products aren’t fully sinking in then they won’t be effective. Wipes just don’t clean as well as a cleanser and besides leaving behind a residue they also just push around makeup, sweat, oil and dirt. To ensure that you don’t have any lingering residue from the wipes and that they don’t leave behind any makeup or dirt, you’ll have to cleanse your skin with water and a cleanser after using the wipes so why not just save yourself the time by skipping the wipes and just going straight for the cleanser. Do you rely on makeup remover wipes instead of just cleanser and water? 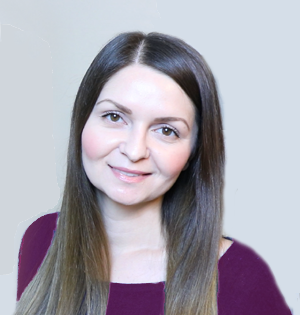 Carmen Popa is a licensed esthetician specializing in the successful treatment of acne. She is the founder of Luminosity Acne Skincare, Inc, located in Cary, North Carolina. Visit LuminosityAcne.com for more information.